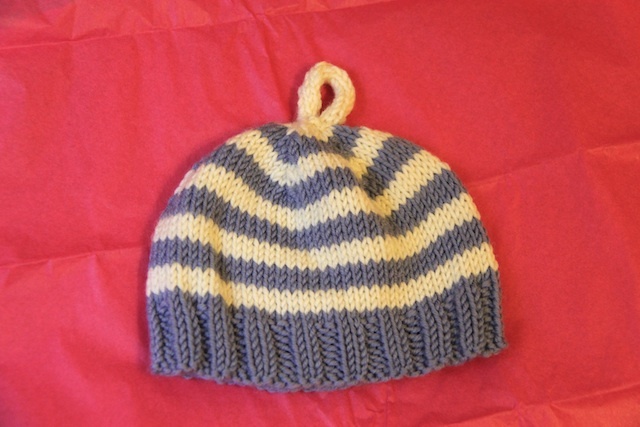 You know, monogamous knitting isn’t so bad when your project is this cute. I was trying to explain to L last night about what makes knitting a little dress so entirely captivating and it’s hard to explain in words. I kept sort of giggling and then showing him the little arm holes and how the back will close with a little button and explaining about the leaf lace trim yet to come and, well, he did not get it (although he did concede that small things are cute). I’m about halfway through the stockinette portion of the skirt. I love how it bubbles out from the little bodice. 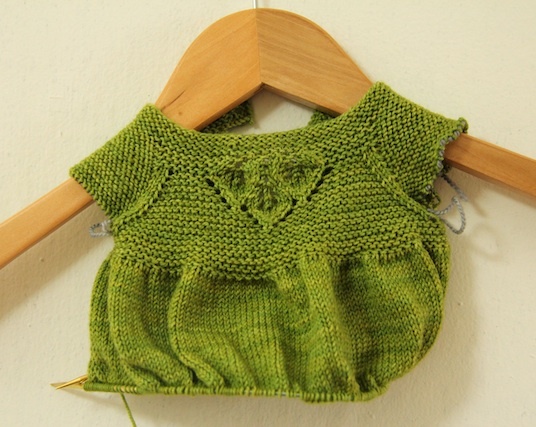 Anyway, if you have a baby girl coming into your life, Sproutlette is the dress to knit. 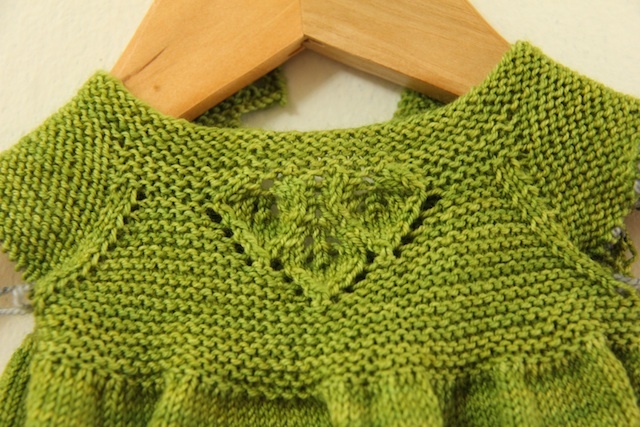 The pattern is straightforward, adorable, and easy to modify. To wit, The baby I’m knitting this for was born in March, which makes her about three months old; the pattern offers three sizes: 0-6 months, 6-12 months 12-24 months. For a three-month old baby (who I have not yet met, and thus don’t have proper dimensions for) this is a bit of a puzzle. I want to knit her something that will serve as a little dress in the summer and early fall, and then transition to a tunic when it gets chilly. Ideally, that’s four to six months of wear, depending on how fast she grows and whether her parents are as entranced by this little garment as I am. So, I’m changing this slightly to fit a baby approximately 3-9 months old. So far, this has been pretty simple. I normally have to go up a needle size to get gauge, so instead of doing that I’ve gone up a size (I’m making the medium) but used the needle recommended in the pattern, giving me a slightly tighter gauge of 30 (instead of 26) sts = 4 inches. I’m working out a couple of other mods, but I’ll explain all those once this is done and they make sense (and I know they work). 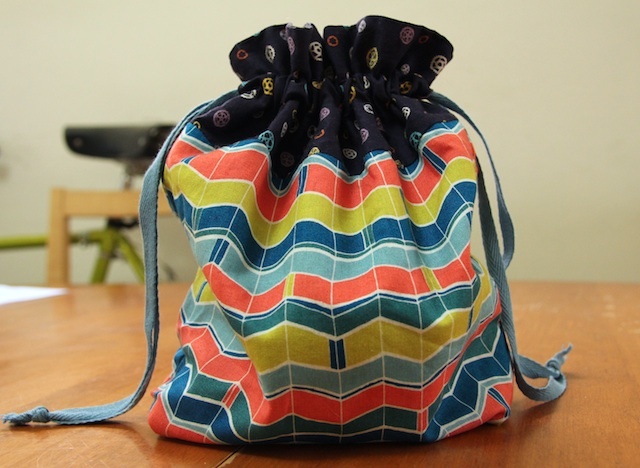 When I cast this on I realized all my project bags were occupied, so instead of taking that as a sign, I just sewed up another one. It’s my new favourite I think. Okay, if I’m going to going to get this finished by Saturday (which really means Friday morning so there’s time to block it) I need to sneak a few rows in before I go to work. it’s funny, because as much as I’m enjoying this knit, I am already looking forward to getting back to Kit, which Cassy has just announced she’s knitting too and, well, now I really just want us both to be finished to see how they look! Is anyone else knitting this tank too? 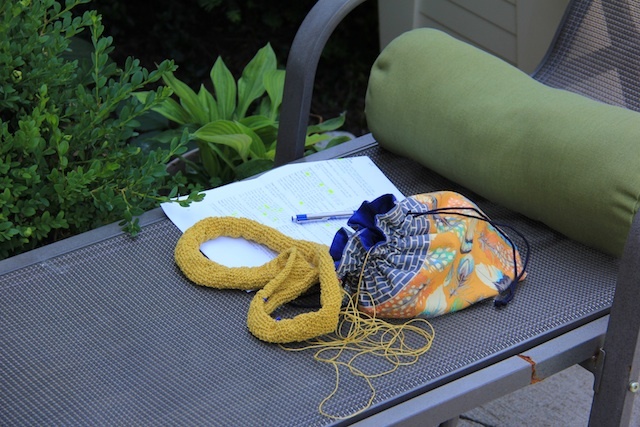 There was less of this than I was hoping for, but I snuck in backyard knitting where I could. Linen! Right? I mean, it’s so sort of rough and crunchy in the skein, but then you start knitting with it and it gets all soft and drapey and wow, I’m a convert. I was worried its stiffness would make my hands hurt or tire out my wrists, but you know, I’m a third of the way through Kit (maybe more than that, actually) and I’m fine. I will say, though, that the border took forever. I tend to feel like that about edgings (especially when you start with them) but this one really forever. I actually gave serious thought to skipping out early, but then I’d look back at the pattern pictures and admire the wide hem and decide the slog was worth it. And you know, if I can block the thing flat I think it probably will be. That 2.5 inches of rolled hem represents close to eight hours of work. So sad. The panel up the back is the same texture, and although some people chose to skip it and just knit the body in stockinette, I really like the detail it gives the piece. I also like how the decreases run up the back, rather than on the sides, making it feel a little swingier and less structured. 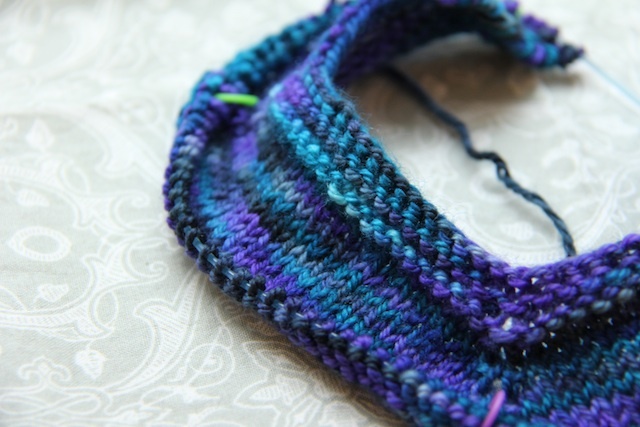 My version won’t actually be as swingy as I would have liked because my gauge swatch lied big time. Like, it was off by about six stitches. Sigh. I knit most of this on the train to and from Windsor (about four hours each way, minus sleeping time since we were up early both days) and on the way back, once I was well into the stockinette portion, I decided to check my gauge. 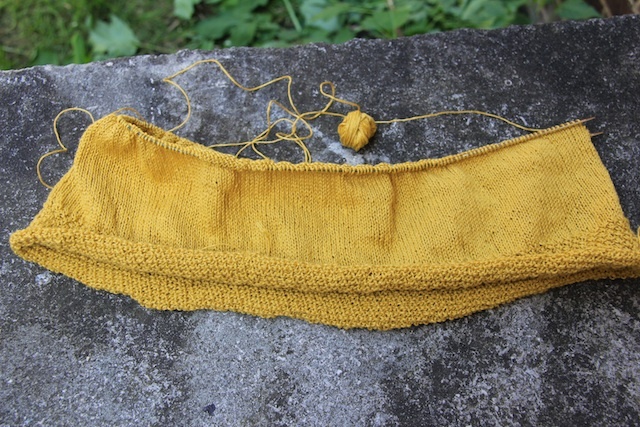 With wool, my gauge is the same flat as it is in the round; not so with linen, it seems. I tried on what I had when I got home, though, and the fit is fine, but not quite as airy as the pattern photos. I really like the fabric I’m getting, though (the stitches are close enough together that I won’t need to layer anything underneath), so to ad drape I’d pretty much have to rip it all back and knit another size. That is, quite frankly, unappealing. So I’m going to keep going, but alter the decreases a bit so it fits nicely across the chest. It might be a little while before I get there, though, since in a week and a half we’re meeting our friends’ baby for the first time (she was born in March, and gifted this little hat and sweater) and dammit I’m not showing up without an adorable gift. That gives me about a week to turn this (still unwound) skein of Malabrigo Sock into a Sproutlette. That’s doable, right? It is so fun choosing fabric. I can 100% get there on public transit without much ordeal, but somehow it always felt like it was going to take my whole day, and it’s been cold, and, well, in the winter you can always find an excuse. We went, though, and I had some fun picking out fabric. I will admit that I expected that fabric to sit around the house for a while before I got around to using it, but then I cast on for a rather overdue baby sweater (the baby has not been born yet, but still) and realized I didn’t have a project bag for it. I know I could have used a Ziploc or something, but I hate doing that. Clearly, this was the perfect opportunity to get sewing. 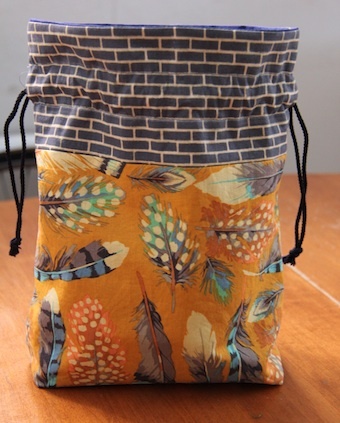 I chose to practice on some fat quarters I bought ages ago, in case it was a disaster, but since it wasn’t I think a few more bags will be made this weekend featuring my new fabric. 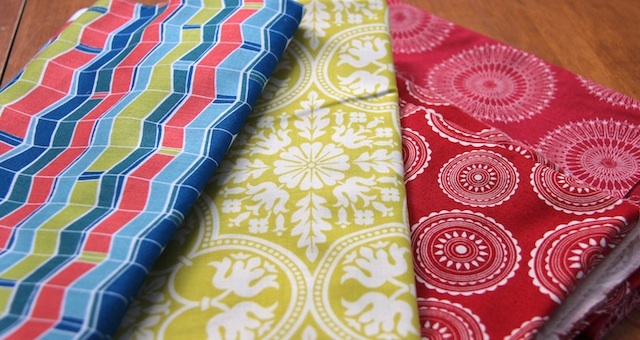 I also bought some quilt batting, so I can add a needle-proof layer for sock bags. This one is more than large enough for the baby sweater, and would comfortably fit a large shawl or fair isle project. I am quite pleased. I promise that there is no danger of this turning into a sewing blog, but it might pop up now and again. We don’t live in a big enough apartment for me to get into quilting, but small blocks? Yeah, that could happen… Ahem. Speaking of knitting and baby sweaters, though, what do you think of this? 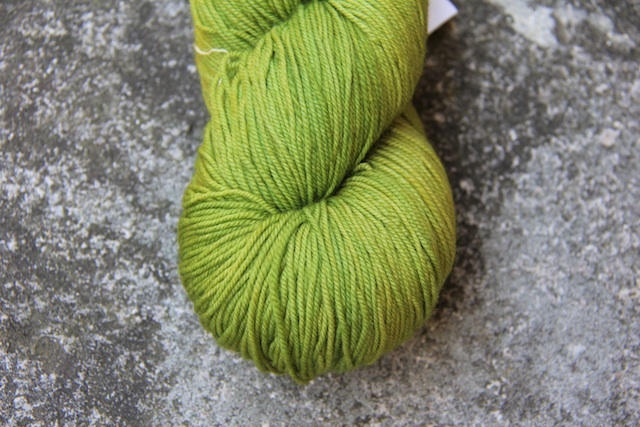 I love the yarn, but I’m worried it’s knitting up too dark (we don’t know the baby’s gender yet). Thoughts? 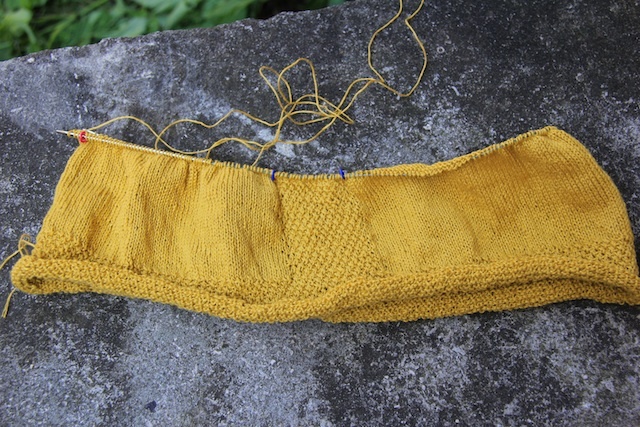 It will be the Puerperium Cardigan. By the time you read this, L and I will be in (or at least on the way) to New York. It’s his birthday on Thursday and, even though I won’t have finished moose gloves to give him (I totally got the first hand done, though! ), I can at least show him a good time in a big city. Although we have both been to New York before, we’ve never been together, so I’m pretty excited (and, before you ask, I’m sorry to say we’ll be heading back to Toronto before Vogue Knitting Live – before the marketplace even opens, actually, which is perhaps for the best, since I don’t want to high jack our trip). We will be staying with friends in Manhattan, and while we have a rough idea of stuff we’d like to see and do, we’re not planning too heavily because we don’t want to feel rushed while we’re there. That being said – what is your New York must-see/must-do? Please tell me so I can impress him with my insider knowledge! Unisex colours, totally girly wrapping paper. I still think they’re having a boy, though.